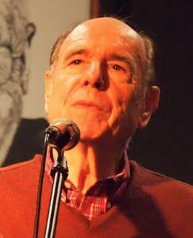 Luis Alberto Ambroggio is an internationally known Hispanic-American poet born in Argentina, and a member of the North American and the Spanish Academies of the Language. He is the author of twenty collections of poetry published in Argentina, Costa Rica, Spain, and the United States, including Difficult Beauty: Selected Poems 1987-2006 (2009), with an introduction by Pulitzer Prize winner Oscar Hijuelos, and The Wind’s Archeology (2011). Ambroggio has also published two books of essays and a collection of short fiction, and co-edited the anthology Al pie de la Casa Blanca: Poetas hispanos de Washington, DC (At The Foot of the White House: Hispanic Poets in Washington, DC; 2010) and edited De Azul a Rojo: Voces de poetas nicaragüenses del siglo xxi (From Blue to Red: Voices of Nicaraguan Poets from the 21st Century; 2011). His poetry is translated into several languages, and is included in the Archives of Hispanic Literature of the Library of Congress.